For more than two centuries, Revere materials have been used in countless applications by the most visionary architects, painstaking craftsmen and cost-conscious specifiers. Wherever it can be imagined, copper fits right in. There is a seemingly endless assortment of architectural possibilities created by copper. It is easily adaptable and aesthetically pleasing in so many places. In addition to roofing, copper is ideal for sidewall cladding, gutters and downspouts, flashings, sunscreens, fascias, interior and exterior accents and more. 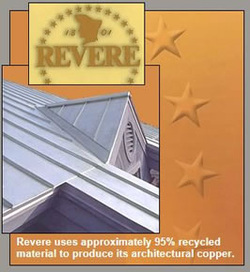 Revere's products include copper and copper alloy sheet, copper strip, copper plate, copper bar and extruded copper profiles. 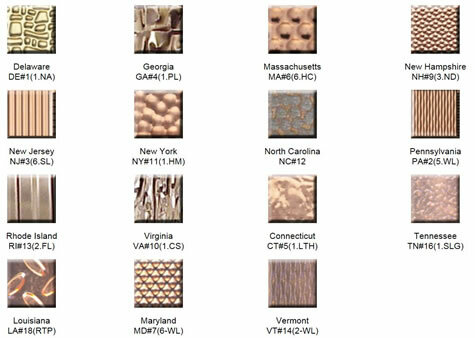 We offer a wide range of differentiated products including market leading architectural surfaces and products, silver flashed bar, and specialty profiles. The Revere Liberty Collection™ is textured copper available in several different patterns, taking the beauty of copper to a new level. Each texture combines attractive appearance with functionality, offering better damage resistance, lower maintenance and enhanced value. The Liberty Collection™ provides a modern, high-tech finish on most surfaces where flat metal would be used. Potential applications for the Revere Liberty Collection™ would be for, but not limited to, elevators, store fronts, doors, countertops, hoods and light fixtures. • Minimizes the effects of "oil-canning"